Take a drive down most any country road or Interstate highway that passes through rural America and you’ll see lots of barns. And if you pay attention, you’ll probably notice that almost every barn that’s painted will be red! If you ask a dozen people why that is you’ll likely receive a dozen different answers. According to the folks at The Farmers’ Almanac and LiveScience, there’s a very practical reason why farmers have traditionally painted their barns red: Simple economics. Most of America’s early farmers didn’t have money they could spend on paint to cover their barns. In fact, many of them couldn’t even afford to paint their houses. Still, they needed to protect their barns from the elements so they experimented with various concoctions until they found one that worked. Once it was developed and proven to work, word quickly spread that a proper mixture of skimmed milk, lime, red iron oxide and linseed oil would protect barn wood from rotting due to exposure to moisture. Luckily, those ingredients were in abundant supply on most farms of the day so they were available even to the poorest farmers. And guess what? Once mixed in the right amounts, that farm-made “paint” had a red hue to it! 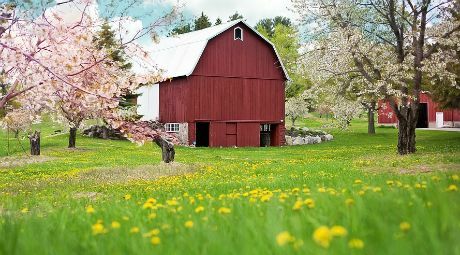 Within a few short years virtually every farm in the country had a red barn on it. Real paint eventually became affordable enough to allow farmers to cover their barns with it, but most modern-day farmers still paint their barns red in keeping with the “red barn” tradition. By the way, have you ever had the opportunity to witness an Amish “Barn Raising”? Watch the short time-lapse video below and you’ll see a group of Amish workers “raise” a barn virtually from the ground up in less than 7 minutes! Hint: Click on the square icon in the lower right-hand corner of the video to watch it at full screen.